The show started with Moon Maan. They're okay, but not my kind of thing. Sounds like a typical alt-rock group where most of the songs sound pretty much the same as the rest. If I learned one thing from the show, it's that TMBG's music appeals to a broad demographic. While I didn't hear any grumbles from the crowd about blatantly liberal statements made by John, the age range was extremely wide. Many fans were my age (30s) but many had black Xs on their hands indicating they were under 21. I even ran into a Junior from my drawing class this summer who was introduced to them via Gigantic (A Tale of Two Johns) (2002) . If I learned two things from the show, it's that I haven't really been keeping up with the band. I have the original stand-bys like Lincoln and They Might Be Giants and I love listening to them, but I don't have any of the new stuff. I guess, when I heard they were starting to do children's music, it didn't occur to me that I was missing 15 years of TMBG history already. Now I need to check out the rest of their catalog and see if there's anything I need to pick up. 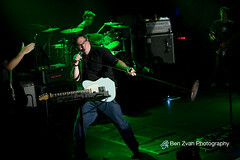 If I learned three things from the show, it's that TMBG puts on an awesome live show. Their audience interaction is flawless, and their energy level was hard for me to keep up with. Every time I took a break from shooting (not gonna do that again), they did something I wished I had caught with the camera. Luckily, my second shooter, MK was there for me. The theme of the show was the "Second Annual Swear-a-Thon", though they only swore a couple of times and slightly sheepishly at that. They made it a goal to play at least one song from every album, which meant we all got to see how good they are at making children's music that parents will like too. I'd recommend them if you're getting tired of listening to Barney every time you get into the car. I didn't make the free, kids show on Saturday due to a conflict with a Belgian beer festival in St. Paul, but a friend made it and had many of the same things to say about them that I do. The live show was great, they kept the audience (kids this time) interested, and basically rocked out for the little ones. I suppose that might explain the wide age range present at First Avenue. The band started out in the 80s with an un-classifiable musical style that appealed to the slightly nerdy non-conformists of the era, they kept at it for 25 years and now, they're playing for the children of their original fans, keeping everyone, including the next generation, happy and involved. I'm glad to see that TMBG has kept creative, fresh and active over their career. Unlike several concerts I've seen, this one renewed my interest in the band. I'll be keeping track of them more closely and definitely seeing their next live show. When They Might Be Giants had their first show, they didn't really think their name might be considered arrogant or even that it might be applied to them. 26 years and 4 million record sales later, I don't think they could ever really have been called "giants" but they've done a respectable job for a couple guys named Jon who play accordion. The cult of TMBG continues on in many forms. Tomorrow night, they'll be performing a live show at First Avenue in downtown Minneapolis with Moon Maan. It's really hard to tell if it's too late to get tickets but if you're a fan and want to see them rock out live, that's the route I'd take if I were you, which I'm not. Obviously. If you have kids and can't get a sitter for a Friday night, then I've got a bit of trivia you won't get from Ticketmaster. Head to Highland Lake Park in Bloomington for a free show at Target Children's Book Festival. It should be much more kid-friendly than a black-painted, dimly lit, loud nightclub with a very high bar-to-audience ratio. 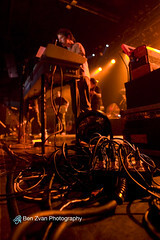 I plan on having a post with photos from the First Ave show early next week. Minneapolis, MN – (Friday, August 1) JAM Productions have just announced that the Nine Inch Nails/Crystal Castles concert originally scheduled for Saturday, August 2 at Target Center has just been postponed due to illness. The band is sincerely sorry for the last minute announcement, but after receiving doctor’s orders not to perform Trent Reznor has reluctantly agreed to the postponement. 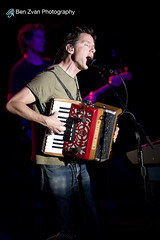 The concert is being rescheduled for Tuesday, November 25, 2008 at Target Center. All tickets purchased for the August 2 concert will be honored on the new date. For those unable to attend the rescheduled date of November 25, a refund will be available at original point of purchase. Looks like some people's Thanksgiving week just got a little busier. Here's a map of all the US and Canadian tour dates. Oh Billy where's your sister where? 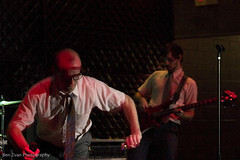 Earlier this week, I heard on Penny-Arcade that MC Frontalot was coming to Minneapolis for his third show on 11-15-2007 at the Triple Rock Social Club. Last time I heard he was coming to town, it was the same day as the show and I already had something going that night. So this time I was damned if I was going to miss it. I had never heard of his opener on the tour Shäffer the Darklord (STD), but he was great even if he does have an unfortunate stage acronym (his joke, not mine) and his interactions with the crowd and with his partner The Black Box were brilliant. I've liked MC Fontalot's music on my iPod, but I've got to say that it's much better in person, even my wife liked it once she could watch the band interacting and playing to the crowd. They really made this an interactive show too. The first thing he said when he came out was "We're throwing out the set-list tonight and making this an all-request show. 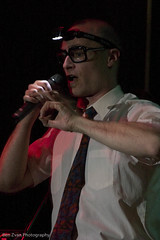 Who's got an MC Frontalot song they want to hear?". The request was made and then "Okay, but you've got to roll at least a three.". She rolled a six and the show started. The one person who rolled a natural 20 was invited to dance on stage but, being nerdcore, elected to choose a second song. The final song was Nerdcore Rising and was prefaced by the crowd yelling "The time we are having is acceptable!" in unison and the keyboardist prompting us to sing the chorus "Nerdcore could rise up" to start the song.